On Day 1 of World Master Card Fashion Week I headed to the tents for one show in particular, Korhani Home. I knew that the Pavoni show as well as the Holt Renfrew presents show was happening that evening but I was relaxing in the Korhani lounge after the show, filming and shcmoozing…there was a lot of schmooze that night. So I had no idea that beautiful couture gowns, cocktail and party dresses were coming down the runway. Truth be told I’d never heard of Pavoni before and had no idea what I’d missed until the following evening when I was standing in line waiting to check-in and the video from the shows the night before were playing I caught just a quick glimpse of the Pavoni show before I began slowing walking towards the monitor, not focusing on the fact that there was a desk between me and it, and I wasn’t even aware that I’d been drawn in. I started looking around for someone I knew so I could ask them whose show it was. My word! I thought that perhaps it was a show from Paris Couture week that I was watching but rational thought concluded that they wouldn’t be showing a collection from some other fashion week. Well they weren’t; someone finally told me that it was the Pavoni show from the night before and regret immediately set in. I couldn’t wait to get the pictures because the few seconds that I had seen had me convinced that I just missed magic on the runway. One of the things that was a pleasant surprise this season at Fashion Week was the return of the Red Carpet gowns, several designers had evening length and Red Carpet gowns as their closing looks; notable mentions go out to Lundstrom whose final three looks were gorgeous Red Carpet worthy looks. But this Pavoni collection was Red Carpet overload and had gowns of an ilk not normally seen during Toronto Fashion Week. Truthfully the last time I saw gowns like this was during S/S 2011 Ramona Keveza collection and I swooned all the out of the runway room when that one was over. 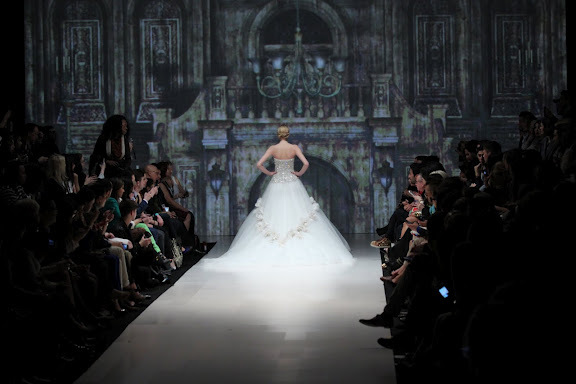 This entry was posted in Events, Runway Shows and tagged Fashion, Pavoni Fall/Winter 2012, Toronto, World Master Card Fashion Week by alexxussknight. Bookmark the permalink.